ATM they are all false strikes away from the sea. nearly 40 strikes per minute,realy ramping up now. Sky occasionally flashing to the east of Truro now. 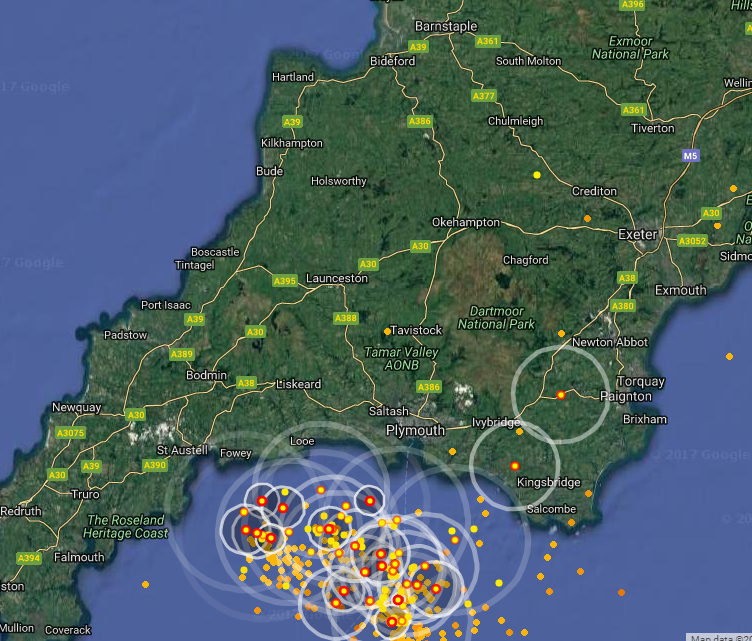 Over 40 strikes per minute off Plymouth. Loads of flashes on there now. http://bluesound.org/webcam Working Fantastic here . Ahh so the storm coming my way dies only for one to spring up going to Cornwall. Typical.. they did better in 2016 than Devon. That storm is going mad now... oh to have something like that here. I can confirm no strikes near me, I think it's throwing out so many that you are seeing a few which are positioned incorrectly. Flickers of lightning shining into the sky.. can be seen in the SE Wales valleys around 13 miles North of Cardiff just under a 100 miles from the cell ! Anyone got any other links to Plymouth as I cannot view the blue sound one for some reason? Just checked the radar and seen it's kicking off west, more west than I was understanding it would? Ah, sorry. It is simply positive and negative intra cloud lightning. They give off different frequencies, like +/- CG but I don't know how you would distinguish +/- intra cloud lightning from sight alone. You can certainly tell a +/- CG from sight and sound, though. Doesn't work for me too,bummer. Constant lightning on that webcam now. Must be more than the 40 per minute it was showing just now. 50 60 a minute now,what a storm this is turning out to be. See my post above, might work for you.